BACKGROUND: Current global and national demographic structures are shifting toward a higher proportion of the elderly population. More than 50% of the population aged above 70 years of age suffers from one or more chronic conditions. Depression is the most frequent psychiatric disorder in the elderly population. OBJECTIVES: The objective of this study was to assess the pattern of morbidity and depression among the elderly people as well as to identify the determinants of depression. MATERIALS AND METHODS: A community-based cross-sectional study was undertaken from September 2014 to June 2015 in the urban field practice area of Hi-Tech Medical College, Bhubaneswar. The simple random sampling was performed to select 450 geriatric people. House-to-house visit was done to interview the participants with a predesigned pretested schedule. The schedule contained baseline characteristics, morbidity questions, Katz activity of daily living (ADL) scale, and geriatric depression scale. Collected data were entered into MS Excel spreadsheet and analyzed with the help of SPSS 22.0 version. RESULTS: Major morbid condition was concerned with Cardio Vascular System (31.7%), followed by cataract and musculoskeletal system. Among the study population, 45.8% had no depression, 15.1% had mild depression, 30.7% had moderate depression, and 8.4% had severe depression. Age, marital status, education, financial dependency, Katz ADL, and chronic diseases were significantly associated with geriatric depression. CONCLUSION: Recreational activities, awareness generation regarding regular exercise, strengthening of social security systems, arrangement of old age homes, legal measures to take care of the elderly, promotion of self-help group, and proper counseling are the measures to be taken to combat geriatric depression at this hour. Aging is a normal, inevitable, biological phenomenon, and it is not known exactly when the old age begins. In India, people aged 60 years and above are treated as old. The United Nations projected that beyond 2016, 21% of the Indian population will be 60 years and above by 2050. Changes in society and economy have an impact on demography transition, and the elderly population in India is still vulnerable despite strong family ties. By 2025, the number of elderly people is expected to rise more than 1.2 billion with about 840 million of these in low-income countries. It is estimated that the population of the oldest old will see a more rapid rise. According to the Population Census 2011, there are nearly 104 million elderly persons (aged 60 years or above) in India; 53 million females and 51 million males. Both the share and size of the elderly population are increasing overtime. From 5.6% in 1961, the proportion has increased to 8.6% in 2011. According to the 2011 Census, 9.5% of Odisha's population consists of the elderly, which is higher than the national average. In Bhubaneswar, there are about 37,825 old persons, of whom 17,151 are women and 5,122 persons above 80 years of age. It is observed that more than 50% of the population aged above 70 years of age suffer from one or more chronic conditions., A large proportion of the geriatric morbidity remains occult due to ignorance and lack of access to healthcare facilities. Depression is the most frequent psychiatric disorder in the elderly population. It is among the 10 diseases that increase disability-adjusted life years the most., Several of the risk factors for depression in old age are physical disorders, sleep disorders, or loss of spouse., Geriatric mood disorders cause suffering, increase medical burden, worsen the outcomes of many medical conditions, and contribute to disability. In addition to this, the depression increases the perception of poor health and the utilization of medical services. Depressed patients had almost twice the number of appointments per year and almost more than twice the number of hospital days over the expected length of stay compared to nondepressed patients. The relatively low prevalence of depressive syndromes identified in the elderly populations may be due to methodological problems, including the tendency of elder persons to express psychiatric symptoms in somatic terms, their reluctance to recall and report psychiatric symptoms, and clinical use of diagnostic categories unsuitable for the elderly. It has been seen that the health problems and felt needs are essential to understand as the population of old age people increasing day-by-day. With this backdrop, the present study had been conducted in the urban field practice area of Hi-Tech Medical College and Hospital, Bhubaneswar, to assess the pattern of morbidity and depression among the geriatric people as well as to identify the determinants of depression among them. A community-based cross-sectional study was undertaken from September 2014 to June 2015 in the urban field practice area of Hi-Tech Medical College, Bhubaneswar, that area caters the population of 14030. The geriatric people aged 60 years and above who are permanent residents of the urban field practice area and were available during the study were included in the study. In a study which was undertaken at the urban field practice area of Guntur Medical College, the prevalence rate of morbidity among the elderly population had been found to be 51.6%. Taking into consideration, this prevalence rate the sample size in the present study has been calculated as: n = z2 pq/d2; where, n = required sample size to be calculated, z (standard normal variate) = 1.96 (at 95% confidence level), P (prevalence of morbidity among elderly population) = 51.6%, q = (100p) = (100–51.6) = 48.4%, and d = desired level of precision or allowable error = 5%. Hence, n = (1.96 × 1.96 × 51.6 × 48.4)/5 × 5 = 383.76 = 384. To allow a margin of nonresponse, absence, illness of the participants, and 20% more sample units have been added, i.e., 384 + 20% of 384 = 460.8. To remain on the higher side, the total sample population was taken as 461. Out of which six elderlies left the study voluntarily, four became seriously ill during the study, and another one's house was permanently locked after giving consent. These 11 cases were excluded from the study population, and the total study population included became 450. Data were collected by the interview of the study participants. A predesigned, pretested interview schedule was used for data collection. It contained two parts: the first part corresponded to sociodemographic details of the participants, and the second part related to morbidity, activity of daily living (ADL), and depression of the geriatric people. Data were collected for 3 days in a week. ADL was assessed by Katz activities of daily living scale, and depression was assessed by short form of geriatric depression scale (GDS) created by Greenberg et al. The short form of GDS consisting of 15 questions was developed in 1986. Questions from the long form of GDS which had the highest correlation with depressive symptoms in validation studies were selected for the short version. Of the 15 items, 10 items indicated the presence of depression when answered positively, while the rest (question numbers 1, 5, 7, 11, and 13) indicated depression when answered negatively. Scores of 0–4 are considered normal, 5–8 indicated mild depression, 9–11 indicated moderate depression, and 12–15 indicated severe depression. The Katz index of independence in activities of daily living, which is commonly referred to as Katz ADL, is an appropriate instrument to assess the functional status of the elderly's ability to perform activities of daily living independently. The performance is based on six functions of bathing, dressing, toileting, transferring, continence, and feeding. For independent activity 1 point is given, and for dependent on doing the activity 0 point is given. They are scored Yes or No for independence in each of the six functions. It is considered fully independent if they score above 5, partially dependent if a score of 3 and 4 is achieved, and fully dependent if they score 2 and below. At first, the questionnaire was prepared in English and subsequently translated into local vernacular language by language experts. Then, it was retranslated into English and compared with previous English version. Any discrepancy was rectified by language experts. Pretesting was done on 45 geriatric people in a nearby slum to make the schedule lucid, intelligible, and in logical sequence. Before conducting the study, the ethical clearance was taken from the Ethical committee of Hi-Tech Medical College and Hospital, Bhubaneswar. During the study, informed verbal consents were taken from the participants, and the confidentiality about their information was assured and strictly maintained. All the houses in the urban field practice area were numbered serially by the field staff of urban health center. A house-to-house visit was made to confirm whether an elderly person was residing in the house. The house numbers where elderly participants were present were noted which constituted the sample frame. With the help of the simple random sampling to ensure randomness of selection, table of random numbers was used to select the sampling units. Initially, a rapport with the family members was made, and informed consent was taken from the participants before the interview. In a family, if there was more than one elderly; information was taken from all of them who met the inclusion criteria. If an elderly was not present for more than two visits, the next house was taken up for the study. Data were collected until the desired sample size was reached. Collected data were entered into MS Excel spreadsheet. Mean, standard deviation (SD), and proportion were estimated as descriptive statistics. Tables and charts were used for displaying data. Chi-square and Spearman correlation coefficients were performed as bivariate analysis. Finally, those attributes which were significantly associated in bivariate analysis were entered in multiple logistic regression model. SPSS 22.0 version (IBM, Armonk, New York, United States) was used to get the inferential statistics. Oldest old: Persons above the age of 80 years. Depression present: Score 9–15 in GDS. In this study, the average age of the study participants was 67.99 ± 6.78 (mean ± SD) years. The “young old” were in majority which made up 68.45% of the study population, followed by the “old-old” which was 25.33%. About half (50.89%) of the study participants were female. Elderly without their spouse constituted 24.66%. Majority of the study population were Hindus which made up 90% of the total study population. The educational status of the elderly showed that majority were illiterate which made up 73.11% of the study population. Majority (85%) of the study population belonged to the joint family. In the present study, it was seen that tobacco chewing was a habit among 54.10% elderly participants and was the most common, followed by smoking 30.94%. Smoking and alcohol consumption was more among the males than the females. About 87% of the geriatric population was financially dependent. 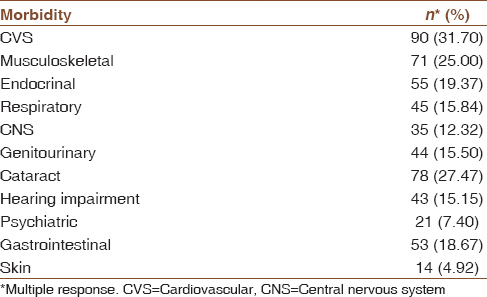 Regarding the morbidity pattern of the study population, it was found that major morbid condition was concerned with cardiovascular system (31.7%), followed by cataract and musculoskeletal system [Table 1]. It was revealed that the median value of GDS score of young old, old-old, and oldest old were 4, 8.5, 10, respectively. 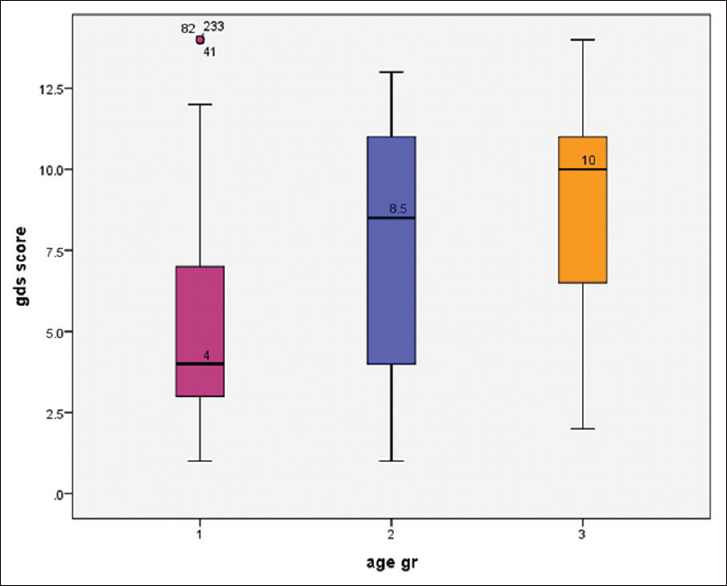 Furthermore, it was seen that interquartile range of 70–79 years of the age group was larger than the other two groups that means there were more variation in GDS score in that group [Figure 1]. The present study revealed that if there was an increase of age, there were an increase of GDS score as well as decrease of ADL score, and these were statistically significant [Table 1]. It was also found that the correlation coefficient between GDS score and ADL score was 0.47 and they were negatively correlated that means if there was an increase in ADL score, there was a decrease in GDS score, and it was statistically significant [Table 2]. The present study showed that 45.8% had no depression, 15.1% had mild depression, 30.7% had moderate depression, and 8.4% had severe depression. 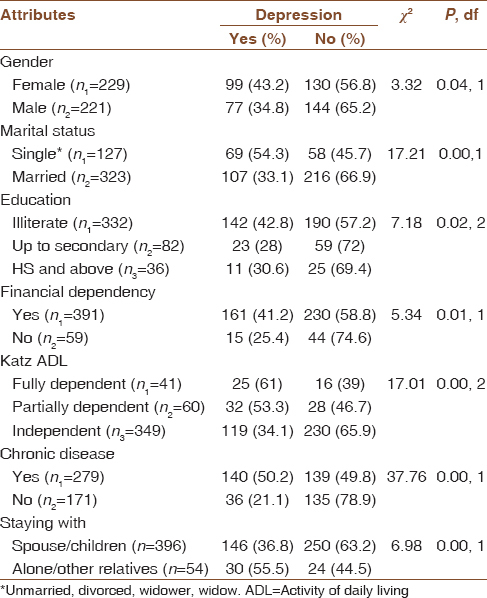 In bivariate analysis, it was found that gender, marital status, education, financial dependency, Katz ADL, chronic disease, and staying with were significantly associated with the presence of depression [Table 3] whereas religion, socioeconomic status, pension, and type of house they are living were not associated with depression. Binary logistic regression revealed that age, marital status, education, financial dependency, Katz ADL, and chronic diseases were significantly associated with geriatric depression considering the confounding effect of other factors in the regression model. It was also found that study participants, who were at and above 70 years, had 1.76 times more depression than the persons who were below 70 years. Single geriatric people had 2.54 times more depression than the married ones. Lower educational status had 2.83 times more depression than the higher educational status. If there were financial dependency, the depression was 3.52 times higher than the persons who were nondependent financially. Regarding the ADL who were dependent had 3.04 times higher depression than the independent persons. The old people, who were suffering from chronic diseases, had 2.52 times more depression than the those who had no such chronic disease [Table 4]. In the present study, young old were the majority, the same was found by Shashi et al. among the elderly in Delhi (67.8%) and by Nautiyal et al. in Dehradun city (58.7%). Male and female proportion of the geriatric population was almost equal in the present study whereas the study conducted by Sharma et al. in Chandigarh and Goyal and Kajal in Punjab found females were more (58% and 59%); and Lean et al. in their study in Amritsar found males were more (61%). The present study revealed that the elderly without their spouse was almost 25% but Shashi et al. found higher proportion (38%). Hindus formed the majority of the geriatric people; the same result was found by Lena et al. (89%). Illiteracy rate was about 73% among the geriatric people; this result was consistent with Niranjan et al. (70%) and Shashi et al. (65%). Higher illiteracy which may be due to the lack of facilities for education when the elderly was in his/her childhood days. The present study found that nearly 87% of old people were financially dependent, Goel et al. and Niranjan et al. found lesser proportion (59% and 70%, respectively). Chewable tobacco was the most common habit and was present in 54.10% of the study population. Smoking habit was present in 30.94% of elderly population whereas 14.95% of elderly people had alcohol consumption as their habits. In a study done by Purty et al., in Pondicherry, it was observed that chewing tobacco was the most common habit (61%), 33.3% were smokers, and 28.7% consumed alcohol in a regular way. Both the results have comparability. About 63.11% of the geriatric people had chronic disease in this study. Chakrabarty et al., in their study, reported that 92.5% and Mohamad et al. reported chronic disease in 62.5% of the participants. In the present study, it was found that major comorbidities were cardiovascular diseases followed by cataract and musculoskeletal disorders whereas Sharma et al. found that the majority of the participants (41.4%) had hypertension followed by diabetes, asthma, arthritis, and some form of cardiac disease. With increasing age, ADL decreases, it was found that 42.86% of the elderly above 80 years of age were totally dependent according to ADL scale. Cacciatore et al., in their study, showed that participants disabled in ADL were 7% and the disability prevalence increased with age. Depression was present in 54% of the study population. The lesser prevalence of depression was found in Swarnalatha (47%), Mohamad et al. in Hamadan, Iran (48.3%) and Amonkar and Mankar (31%). Comparatively higher rate (62%) of depression in elderly found by Grover et al. In bivariate analysis, the present study revealed a significant association between geriatric depression and determinants such as age, marital status, education, financial dependency, Katz ADL, chronic disease, and staying with whereas Amonkar andMankar found that the determinants were age, education, place of residence, and comorbid conditions. Grover et al., in their study, found more or less similar demographic risk factors as the present study. In the present study, logistic regression analysis showed that elderly having financial dependency, lower educational status, single marital status, chronic diseases, lower ADL, and more age were found to be more depressed whereas Sharma et al. found the risk factors in logistic regression were lower income, consuming tobacco, experiencing stressful life event in the past 1 year, having 3 or more chronic diseases, and lacking positive approach toward the life. Sengupta and Benjamin, in their study, showed that multivariate analysis could not find any relationship between geriatric depression and unmarried/widowed status, unemployment, and illiteracy. However, the present study revealed a different picture. This difference may be due to the different setting of the study, as Sengupta did their study in urban and rural setting; however, the present study was in urban setting only. The present study showed a significant association between daily activity and depression, which was more frequent in those who did not have enough daily activities. Mohamad et al., in their study, found the same result. Furthermore, there was a statistically significant relationship between chronic diseases and depression, this finding was consistent with Mohamad et al. and Wong et al. Special focus should be given on mental health of the elderly as it is a neglected area in our country. Public-private partnership models in health promotion of the elderly should be done to minimize the workload of the government health facility as well as to cut down the health expenditure of the private hospitals. Recreational activities should be promoted among the elderly population. Awareness about regular physical activity should be generated by the health workers to lead an active life. The social security system should be strengthened to reduce the fear of elderly people for financial dependency on their children. The arrangement of old age homes for those, who are alone and without family support, should be provided. Legal measures should be developed, so that the children take the responsibility of taking care of their parents in their old age without any negligence. Promotion of self-help groups, organizing events for the elderly will prevent loneliness among the elderly population. Counselors should be made available, and proper counseling should be done to support the elderly from mental breakdown and improve their quality of life. Suryakantha AH. Community Medicine with Recent Advances. 3rd ed. New Delhi: Jaypee Brothers Medical Publishers; 2014. p. 737. World Population Ageing: 1950-2050. Department of Economics and Social Affairs. United Nations Population Division; 2002. Available from: http://www.un.org/esa/population/publications/worldageing19502050/. [Last accessed on 2018 Jun 30]. Prakash R, Chowdhary SK, Singh US. A study of morbidity pattern among geriatric population in urban area of Udaipur, Rajasthan. Indian J Community Med. 2004;29:1. Available from: http://www.medind.nic.in/iaj/t04/i1/iajt04i1p35o.pdf. [Last accessed on 2018 Jun 30]. Health action. Eldercare. 2004;17:2. Available from: http://mmj.net.in/eJournals/_eJournals/8_Original%20Research%20Article.pdf. [last accessed on 2018 Aug 03]. Rosenblatt DE, Natarajan VS. Primer on Geriatric care – A Clinical Approach to the Older Patient. Cochin: Printers Castle; 2002. Population Census; 2011. Available from: http://www.census2011.co.in/data/village/326879-uttarbankati-west-bengal.html. [Last accessed on 2016 Nov 22]. Bhubaneswar City Population Census; 2011. Available from: https://www.census2011.co.in/census/city/270-bhubaneswar.html. [Last accessed on 2017 Jun 20]. Reddy PH. The health of the aged in India. Health Transit Rev 1996;6:233-44. Kumar V. Health status and health care services among older persons in India. In: Leibig PS, Ranjan S, editors. An Ageing India-Perspectives, Prospects and Policies. India: Rawat Publications; 2005. p. 6-70. Lecrubier Y. The burden of depression and anxiety in general medicine. J Clin Psychiatry 2001;62 Suppl 8:4-9. The Global Burden of Disease: 2004 Update. Switzerland: World Health Organization; 2008. Available from: http://www.who.int/healthinfo/global_burden_disease/2004_report_update/en/. [Last accessed on 2018 Jun 30]. Stoppe G. Depression in oldage. Bundesgesundheitsblatt Gesundheitsforschung Gesundheitsschutz 2008;51:406-10. Available from: https://www.kvberlin.de/20praxis/70themen/depression/s3_nvl_depression_lf.pdf. [Last accessed on 2017 Jun 20]. Wong SY, Mercer SW, Woo J, Leung J. The influence of multi-morbidity and self-reported socio-economic standing on the prevalence of depression in an elderly Hong Kong population. BMC Public Health 2008;8:119. Rimer Z, Angst J. Mood disorders. In: Sadock BJ, Sadock VA, Ruiz P, editors. Comprehensive Text Book of Psychiatry. 9th ed. New York: Lippincott Williams & Wilkins; 2009. p. 1645-51. Bhubaneswar Municipal Corporation. Orissa: Government of India. Available from: http://www.bmc.gov.in/[Last accessed on 2016 Jun 10]. Madhavi KV, Kumar BA, Reddy BC, Kumar BP. Morbidity pattern among the elderly population in the urban field practice area of Guntur Medical College, Guntur. J Evol Med Dent Sci 2013;2:p10277-83. Available from: http://www.scholar.google.co.in/citations?user=hOAZWVwAAAAJ&hl=en. [Last accessed on 2017 Jan 23]. Greenberg S.A. How to Try This: The Geriatric Depression Scale: Short Form. AJN.2007; 107:60-9. Available from: https://www.ncbi.nlm.nih.gov/pubmed/17895733. [last accessed on 2018 Aug 4]. Health of Elderly; 1989 WHO Technical Report Series 779. Available from: http://www.apps.who.int/iris/handle/10665/39521. [Last accessed on 2018 Jun 20]. Shashi K, Mishra P, Goswami A. Morbidity among elderly persons residing in a resettlement colony of Delhi. Indian J Prev Soc Med 2004;35:1-9. Available from: http://www.medind.nic.in/ibl/t04/i1/iblt04i1p1.pdf. [Last accessed on 2018 Jun 10]. Nautiyal A, Satheesh Madhav NV, Ojha A, Sharma RK, Bhargava S, Kothiyal P, et al. Prevalence of depression among geriatric people in Dehradun city of Uttarakhand, India. J Depress Anxiety 2015;4:1-3. Sharma MK, Swami HM, Gulati R. Lifestyle and morbidity profile of geriatric population in urban area of Chandigarh. J Indian Acad Geriatr 2005;1:122-5. Available from: https://www.ajol.info/index.php/ijmbr/article/viewFile/91913/88206. [Last accessed on 2017 Feb 26]. Goyal A, Kajal KS. Prevalence of depression in elderly population in the southern part of Punjab. J Family Med Prim Care 2014;3:359-61. Padda AS, Mohan V, Singh J, Deepti SS, Dhillon HS. Health profile of aged persons in urban and rural field practise areas of medical college, Amritsar. Indian J Community Med 1998;23:72-6. Available from: http://www.medind.nic.in/imvw/imvw8060.html. [Last accessed on 2017 Feb 10]. Lena A, Ashok K, Padma M, Kamath V, Kamath A. Health and social problems of the elderly: A cross-sectional study in Udupi Taluk, Karnataka. Indian J Community Med 2009;34:131-4. Niranjan GV, Vasubdhara MK. A study of health status of aged persons in slums of urban field practise area, Bangalore. Indian J Community Med 1996;21:37-40. Available from: http://www.ijcm.org.in/article.asp?issn=09700218;..1996;...21;....;spage.....;epage..... Niranjan. [Last accessed on 2018 Jun 29]. Goel PK, Garg SK, Singh JV. Unmet needs of the elderly in a rural population of Meerut. Indian J Community Med 2003;28:165-6. Available from: http://www.medind.nic.in/iaj/t03/i4/iajt03i4p165.pdf. [Last accessed on 2018 Jun 30]. Purty AJ, Bazroy J, Kar M, Vasudevan K, Veliath A, Panda P. Morbidity pattern among the elderly population in the rural area of Tamil Nadu, India. Turk J Med Sci 2006;36:45-50. Available from: http://www.ijcmph.com/index.php/ijcmph/article/view/719. [Last accessed on 2018 Jun 20]. Chakrabarty D, Mandal PK, Manna N, Mallik S, Ghosh P, Chatterjee C, et al. Functional disability and associated chronic conditions among geriatric populations in a rural community of India. Ghana Med J 2010;44:150-4. Mohamad Ali SR, Ghaleiha A, Hosseini SM, Nikooseresht M, Zahirnia M. Depression prevalence and underlying risk factors in the elderly of Hamadan, Iran. Avicenna J Neuro Psych Physiol 2015;2:e26706. Available from: http://www.avicennajnpp.portal.tools/47680.pdf. [Last accessed on 2018 Jun 29]. Sharma K, Gupta A, Sharma RC, Mahajan N, Mahajan A, Sharma D, et al. Prevalence and risk factors for depression in elderly North Indians. J Geriatr Ment Health 2016;3:158-63. Available from: http://www.jgmh.org/article.asp?issn=2348-9995;year=2016;volume=3;issue..... Sharma. [Last accessed on 2018 Aug 04]. Cacciatore F, Gallo C, Ferrara N, Abete P, Paolisso G, Canonico S, et al. Morbidity patterns in aged population in Southern Italy. A survey sampling. Arch Gerontol Geriatr 1998;26:201-13. Swarnalatha N. The Prevalence of depression among the rural elderly in Chittoor district, Andhra Pradesh. J Clin Diagn Res 2013;7:P1356-60. Amonkar PS, Mankar MJ. Geriatric depression and associated risk factors: A cross-sectional study in an urban setting. MGM J Med Sci 2015;2:179-83. Available from: http://www.jaypeejournals.com/eJournals/ShowText.aspx?ID=8451&Type. 35. [Last accessed on 2018 Aug 04]. Grover S, Malhotra N. Depression in elderly: A review of Indian research. J Geriatr Ment Health 2015;2:4-15. Available from: http://www.jgmh.org/article.asp?issn=2348-9995;year=2015;volume....;issue.... Grover. [Last accessed on 2018 Aug 04]. Sengupta P, Benjamin AI. Prevalence of depression and associated risk factors among the elderly in urban and rural field practice areas of a tertiary care institution in Ludhiana. Indian J Public Health 2015;59:3-8.